I’ve been noticing more and more women expressing interest in their relationship with the moon. If you’re familiar with my work then you know that the moon is my absolute favourite symbol of the feminine! Women’s periods have been tied to the moon and the lunar cycle for literally thousands of years. This moon connection already exists deep within you, doesn’t it feel good to acknowledge it? Traditionally, women’s menstrual cycles lined up with the phases of the moon: they would ovulate with the full moon and bleed with the new moon. This is called a White Moon cycle, and it is historically considered the ‘optimal’ cycle. The full moon is linked to ovulation (the most fertile time of a woman’s cycle) because it is the most fertile time for nature in general: plants and crops get a burst of extra light at the full moon, and the ocean tides are higher. It’s as if the earth itself is renewed by the full moon energy. 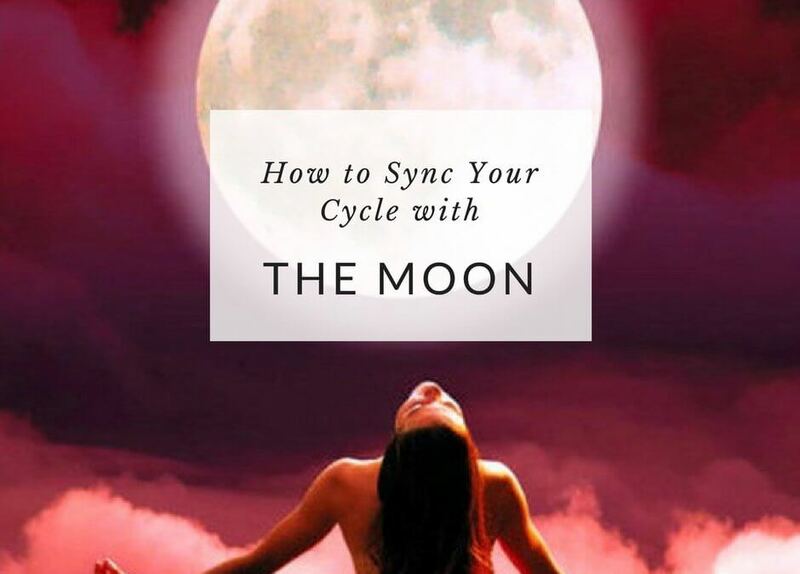 However, some women bleed with the full moon and ovulate with the new moon – this is called a Red Moon cycle. Typically these women were the witches, healers, and midwives within the community. If you are a Red Moon woman, it doesn’t mean you are any less healthy or “attuned” to the moon — in fact, a Red Moon cycle brings its own unique gifts! There’s no need to try and force your body to cycle in a certain way. What matters most is that you are have a cycle that is consistent for you. If you are cycling regularly, your cycle is healthy, and you have a predictable cycle length (meaning a similar number of days each month), then you don’t need to worry about what the moon is doing. But if you feel called to try cycling with the moon, there are some things you can do to gently shift your body. The first step in aligning your body with the moon is to tune into what the moon is doing. Get outside every night if you can and look for the moon. Where is she in the sky? Feel her glow on your skin. If you’re someone who lives in a highly light-polluted area like a big city and you can’t access the moon in this way, I highly recommend you get yourself a moon phase calendar for the year and put it up somewhere where you can see it everyday. Even this small step will help you start to relate to the moon on a daily basis, and moon-connection magic will begin. It used to be that human beings were only exposed to light from either the sun or the moon but when electricity was invented, our natural rhythms of light and dark became artificially altered, and women’s cycles began to change. We now live with an incredible amount of light pollution. And because we are so out of touch with the light and dark patterns of the natural world, our cycles don’t always look like they used to. The worst culprits are our screens (like the screen you’re looking at right now! ), which emit endocrine-disrupting blue light. This blue light exposure seriously compromises our pineal gland’s ability to make the hormone melatonin, which throws off our ovulatory rhythm and can cause irregularities in our cycle. Yikes! I would highly recommend downloading a program like this one that changes the light of your screen to a warm orange-y glow. So when you’re looking at your phone or computer screen at night your melatonin production won’t be compromised. The darker your bedroom is, the more melatonin you will produce while you sleep. If you can, sleep in a completely dark room: the goal is to not be able to see your hand held in front of your face. You may not need blackout curtains if you live in a more rural area with less light pollution. If you live in a city but don’t want to install blackout shades, a great alternative solution is an eye mask. I prefer the kind with rounded eye areas so the mask isn’t directly pressing against the eyelid. If you’re trying to shift your ovulation to the full moon, mimic the effects of the moonlight coming through the window by keeping a nightlight by your bed on the full moon. This will trigger ovulation. Read more about that here. Make sure to get as much sunlight as you can during the daylight hours. It’s just as important to your circadian rhythm that you get out from behind your screen and expose yourself to some natural sunlight during the day! If you haven’t already begun this practice, I encourage you to begin charting your menstrual cycle. Moon charting is the practice of keeping track of how the current day of your menstrual cycle aligns with the current phase of the moon. The completed moon chart then acts as a visual representation of the way your cycle of ovulating and menstruating lines up with the moon’s natural waxing and waning. Moon charting is important even if you aren’t trying to sync your cycle with the moon, because it allows you to create a strong visual reminder of your own patterns. You’ll know what you expect and how to nurture yourself through each phase – because you know each week is different. You may find that you experience certain emotions, physical sensations, or even discomforts around the same day or week in your cycle. Noticing these patterns is essential to understanding yourself a cyclical being, just like the moon. Check out my Moon Charting Mastery course to download a Moon Chart PDF and get started today! This one is my favourite: carve out some time during the month to engage in delightful rituals that honour the moon. It could be as simple as lighting a candle and doing some journal-writing. During the full moon, reflect on the things that are ripening in your life. What new things are you creating and bringing forth in the world? On the new moon, reflect on what your intuition is telling you. The new moon carries the menstrual energy of the Wise Woman, who invites us to go within. Tell me: do you feel called to sync your cycle with the moon? Have you tried any of these practices? I’d love to hear from you! If you are interested in diving deeper into your connection to the moon and maximizing the rhythms of your cycle, check out my Moon Charting Mastery program.